Monday afternoon I got back from vacation with a suitcase full of dirty laundry, four camera cards full of photos, and an injured hand and rib. The short story on the injuries is that after tiptoeing around for a week on Maine’s rocky shorelines and mountainsides, terrified I’d either break an ankle or wind up swept away by the tide, I made it intact to Boston only to step out of the car and trip over a suitcase. I’m slowly recovering from the physical injuries (I can almost hold a cup of coffee without whimpering), but I’m not sure my dignity will ever be the same. I’m just glad there aren’t photos of me sprawled on the bricks outside the hotel and that no one knows about it other than my family, the hotel doorman and manager… and all of you. The problem with coming back to a place like Jackson, Mississippi, in August is that even after as few as 10 days away, you (or, rather, I) get unused to the stifling heat and humidity; you get off the plane and walk smack into a cloud of steam, heat, and mosquitoes and wonder why you (I mean I) wanted to come back. And you suddenly know why we (and I definitely mean I) have a weight problem in Mississippi: It’s too damn hot to do anything. Including cook. Which brings me to this recipe. 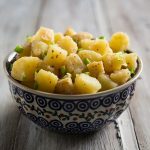 When I got home to my inadequately air conditioned house, I wanted cool food–food that was cool to eat as well as cool to make–and what could be cooler than cucumber? 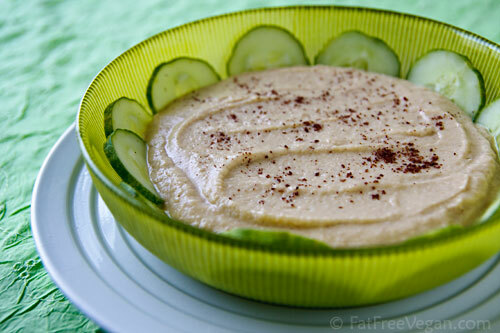 I’d been mulling over adding cucumber to hummus for a while to lighten it up; even with only a little high-fat tahini added, hummus is a pretty calorie-dense food, and I tend to eat too much of it if I’m not careful. 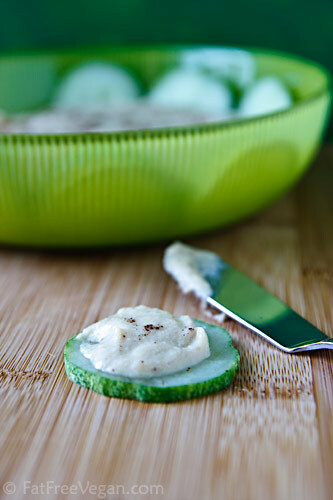 In this super simple recipe, chopped cucumber takes the place of some of the liquid normally used to make hummus and makes the dip lighter and a little fluffier. It’s also a little thinner than most hummus, but that makes it perfect for scooping up with carrots, celery sticks, or more cucumbers. Put the cucumber, water, garlic, and flax seed into a blender or food processor and blend on high speed until frothy. Add the remaining ingredients (except sumac) and blend on high until smooth. Pour into a bowl and refrigerate until chilled and slightly thicker. Sprinkle with sumac and serve. Lots of Hummus on this Blog! I think you read my mind. While southwest Montana is not hot and humid (unseasonably cool actually which is not as wonderful as it may seem our garden still thinks it is June) we finally have cucumbers in the garden. I have garbanzos cooking in the crockpot for hummus. So after reading your post I am definitely adding cucumbers when I make hummus tomorrow. Karen, I’m so jealous – I can’t even think about turning on the crockpot! SO looking forward to cooler days ahead. Sounds delicious. I’m always down for hummus and love trying out new variations. Thanks for sharing! 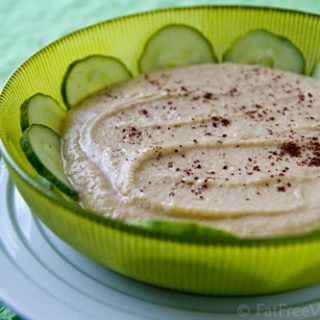 What a great idea to add cucumber to humus. I love humus but agree that sometimes if feels too heavy. Sorry to hear about your injury, Susan! What a gorgeous landscape photo, AND a gorgeous hummus photo 🙂 I’ve got some sumac for the first time but haven’t known what to add it to, so thanks for the inspiration. I’m glad you are O.K. and recovering from your trip… no pun intended. O.K., maybe a little pun intended, lol! Of course, I am one to talk. A couple years back, I mis-stepped and twisted my ankle while walking away from a garage sale. It took me about 6 months to recover. My hubby renamed me “Gracie,” lol! Thanks, Grac…um, I mean Aimee! 🙂 About the tahini, you can always use sesame seeds, if you have them, or a couple of drops of sesame oil (literally, a couple of drops because I find that sesame oil can really overpower hummus). I’ve also made hummus with walnuts instead of tahini, so feel free to use any nuts you have onhand. And I’ve never done it, but I’ve heard from people who swear that peanut butter tastes good in hummus. okay, I’m probably being difficult here, but I also have no tahini, and my mom’s allergic to nuts. Is it possible to just leave it out alltogether? You can just leave it out or you can replace it with another teaspoon of flax seeds, which might give it a “healthier” taste but would add some thickness. I’ve done peanut butter in hummus and it’s great! I love hummus and I’ve been using cukes for dipping into it for years, but I never thought of using cukes IN the hummus. I can’t wait to try this! it looks like something I would really enjoy. Did you seed the cucumbers or just toss them in the blender? I’ll give it a try without seeds. thanks for the recipe. The cucumber I used had very small seeds, so I didn’t bother to seed it. Besides, my blender does a great job pulverizing them. But if you like, go ahead and seed them. So sorry to hear of your falling and hurting yourself. At least you didn’t end up in the hospital, looking on the bright side. What a beautiful view from where you are sitting! The hummus looks wonderful and one of our local farms has been selling 6 for a dollar. yay! Mmmm!!! This recipe look good! I don’t speak english very well… I thonk to try this hummus tomorrow!! 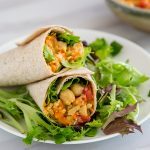 Thanks for your wonderful site about vegan recipe! 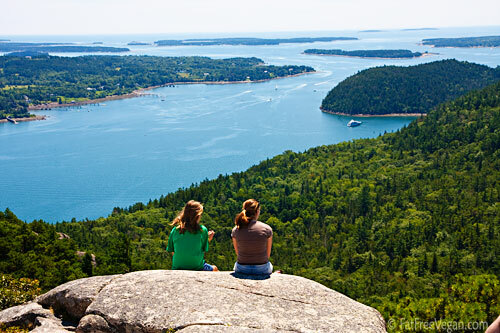 I’m actually leaving for Acadia National Park next weekend! Is there anything you suggest I do while up there? And most importantly, were there restaurants with vegan food?! If you can, try to visit the Schoodic peninsula part of the park. When we were there, the huge waves crashing on the rocky outcroppings of the coast were spectacular. Also, the climb to the top of Acadia Mountain, on the west side of Mount Desert Island, is really worth it for the view of the Somes “fjord” below. We ate at two restaurants in Bar Harbor. Tamarind is a panini and pizza place that caters to vegans by using vegan cheese and “meats.” They also sell vegan products from their refrigerator case. They had free wi-fi, so we ate there twice. 🙂 (If you have an iphone, it won’t send or receive data in Acadia, so wi-fi is appreciated.) We ate breakfast in a restaurant called Cafe This Way, located just behind Tamarind. The breakfast was good–you could order scrambled tofu any way you wanted–but the portions were small and the home fries weren’t vegan. In Southwest Harbor, on the other side of the island, we ate at Chow Maine, an Asian restaurant that had decent food but terrible service; there was only one waiter to handle the whole place plus take-out orders, and it took forever to get our bill. I hope you enjoy your trip. It really is a beautiful place! And thank you for the heads up on the iphone, we rely on it heavily on vacation! I fix your tomato humus frequently and get lots of complements as well as threats of theft from our communal refrigerator at work. So far, no one’s actually done that. I cannot wait to try this version. Suggestion: use True Lemon rather than lemon juice. That way, you get the lemon taste without the juice. I’ve used it when I add too much cooking “juice” but needed a bit more zing when making “ordinary” hummus. Works nicely. You forgot?! I cannot believe that it was 2006. That seems forever ago. I discovered that canned tomatoes take oven roasting well. I needed some for a pasta sauce I was making for work. I ended up dumping a couple of cans of diced tomatoes into a glass baking dish and roasting them for about 45 minutes. Tomatoes lighten the hummus tremendously. I’ve altered the tomato, on occasion, and used cumin and chipotle instead of the basil and left out the balsamic as well. Other ways to lighten hummus: add some cooked mashed parsnips or cauliflower (suggestions from Ana Sortun’s Spice and Moskowitz/Romero’s Veganomicon, respectively–their version aren’t fat free, but these additions do help to lighten the texture). Flavor boosters: Try Minor’s flavor concentrates. There are several flavors available–Ancho Pepper, Roasted Garlic, Roasted Onion, Roasted Mirepoix, and Roasted Red Pepper are all vegan. I get mine at soupbase.com; they are also carried in gourmet food stores (though I haven’t seen a store that carries the whole line). that recipe looks perfect! i love the flavor of cucumber, but in recent years the texture of them has left me feeling kind of nauseous. this is awesome, since i get all the flavor and none of whatever it is that makes me feel ill about them these days. also, i’ve been to arcadia! so beautiful! Guess I shouldn’t complain about our not- so- hot weather in Southern California. Can’t believe we’re into August and it’s still only in the low 70’s and low 60’s at night! About your recipe, I cook my own beans. How much chickpeas would you use? Love the idea of this hummus!! I also love hummus and can easily overdo. Just bought two huge organic cucumbers yesterday, I will try this recipe pretty soon! Very creative to use cucumbers. I would like it, but I’d have to keep that part secret from my cucumber-judgemental family. I made this hummus this past weekend, and I think I used too much cucumber. It was kind of watery. Or maybe I was just too anxious and didn’t let it sit long enough in the fridge! My friends did enjoy it, though. Making your cauliflower “no-fredo” sauce for the gazillionth time tonight! Fresh cauliflower for only $3 a head at the farmer’s market this past Saturday….can’t beat it! I was searching around for ETL recipes and came across this one. I had all the ingredients and decided to put it together. Fantastic! It took me all of 10 minutes and I now have a new favorite hot weather recipe. BTW your Smoky Refried Bean Soup recipe is my favorite cold weather recipe. Thanks! we loved it, even in cool alaska. so i avoid them- but cucumber was Perfect! way to go, Susan! You have my sympathy. I am known for my spectacular falls (think Chevy Chase doing Pres. Ford). My last stunt was at a farmers market with just purchased organic beef steak tomatoes and peaches. They remained unblemished but my knees and hands looked like I was beaten with a bat. Leave it to me to trip over the only rock in the parking lot. What a fun sounding hummus- looking at all of your hummus recipes it seems you love it as much as I do! Photo on rock is gorgeous. Sorry to hear about your “incident”! I’ve done some spectacularly graceful things in my past, so I feel your pain. This hummus looks great – can’t get enough different recipes for it – the walnut option really interests me. I’ll have to look for True Lemon – haven’t heard of it. Thanks again! Sorry about your mishap. Having a tendency to do just such a thing, I can empathize with you! Your recipe sounds great. Might I make a suggestion to try next time? Try using mushrooms to make a dip. I’m trying raw for thirty days and I made a mushroom sauce just by blending mushrooms with other ingredients. It turned out creamy and delicious. I think teamed with tahini and lemon juice it would be fabulous. I may try it today! MMMM….. Made this with cucumbers from the garden. Delish! This is a great recipe! 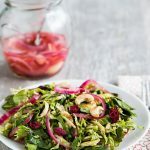 My family has an abundance of cucumbers in their garden and this is a great way to use them up! I think even more than one cup of cucumbers might be nice too. I didn’t try any of the variations and I didn’t have sumac, but it still came out very tasty indeed! Thanks for the recipe Susan! I forgot to update this when I made this hummus but I wanted to mention for other readers it doesn’t last long as it gets watery after awhile (at least it did for me) and my family didn’t really like it as much as the red pepper hummus. I liked it though! I tried this, and honestly I wasn’t crazy about it. In fact, I threw it away. But I don’t really like cucumber juice to begin with, so that’s probably why. I usually love hummus, but the cucumber just kind of ruined it for me. But I’m sure if you like cucumber juice this would be a nice cool snack for you! 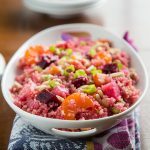 * Always looking for tasty protein sources, and ways to use up the last of our fall garden produce! * Thinly slice several mint leaves. I use spearmint, as it grows abundantly in our garden. We like it very much, so I used 10 or 12 leaves. * Mix in a small amount of white sugar, since cucumbers can be bitter this time of year. I used approximately 1 Tablespoon. * Peel, seed, and thinly slice 1 cucumber. * Add 1 to 1.5 cups of white beans. I used Goya cannellini beans. I rinsed them. Dress with a light oil and mild vinegar. I used Zvijezda sunflower oil, and Centrella apple cider vinegar. Just made this; a definite keeper. What a great hummus recipe. The second time I made it I removed the seeds from the cucumber, and used maybe 1 T water. End result was much thicker. Always double the recipe to share with my best friend. Much lighter than traditional hummus. I did add some cumin and halved the tahini. Delicious! Can’t wait to share it. Added a few shakes of cumin, a few splashes of Bad Brains Fearless Vampire Killer Hot Sauce for some kick. Worked out great.